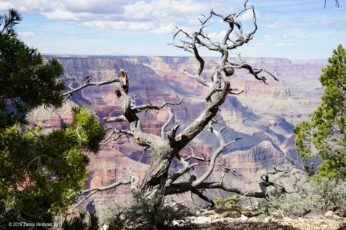 With 6 million visitors per year, it’s the second-most visited national park after Great Smoky Mountains NP – which is surrounded by developed areas, doesn’t charge an entrance fee, and has a major roadway running right through its middle. 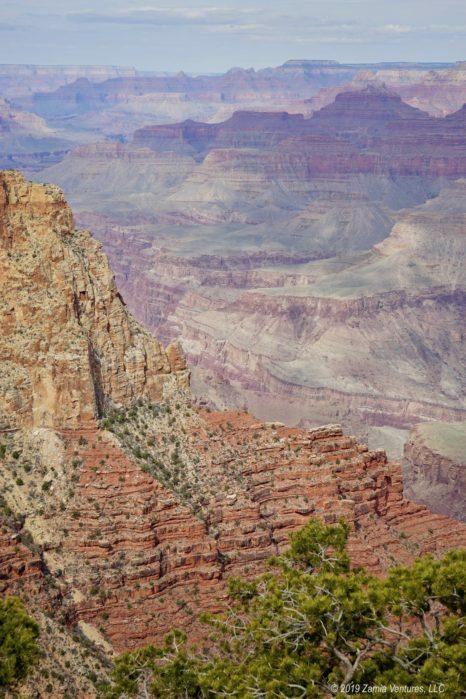 The Grand Canyon is America’s top destination park, and 90% of those visitors go to the South Rim. 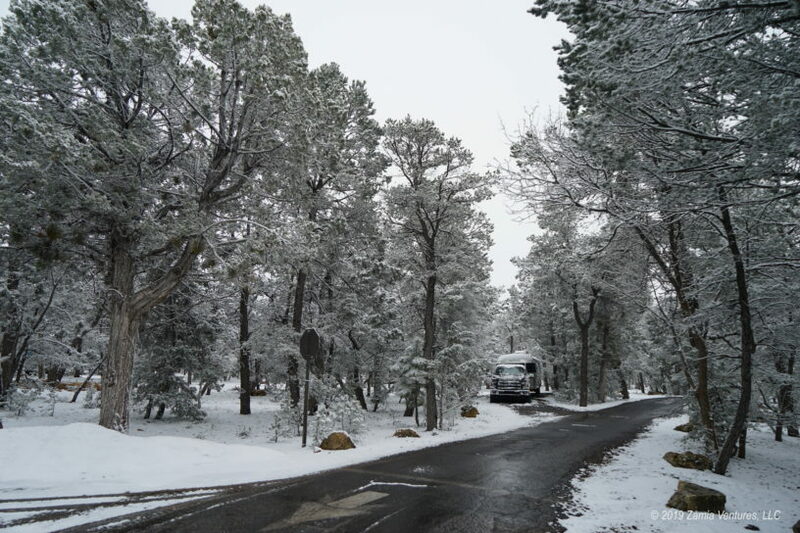 When we made our plans to visit the park, we knew that only the South Rim fit into our schedule; the North Rim is closed at the time we are in the vicinity because of its higher elevation and more severe winter weather. 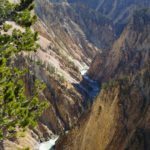 Even though we visited fairly early in the season, it was still a challenge getting camping reservations, and it was with only a little dread that we prepared ourselves for an onslaught of tourists when we arrived in the park. The five full lanes of traffic at the entrance were not encouraging at all. But over the course of our brief four-night stay, we came to appreciate just how well the NPS has designed this park to handle the massive crowds it experiences. 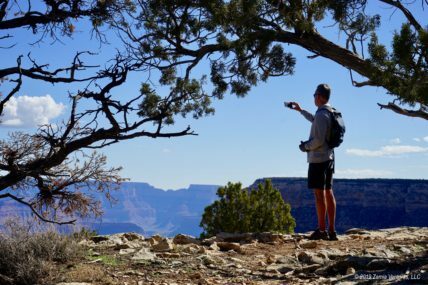 Most of the main destinations are clustered in the Canyon Village area, and there are broad paved walkways connecting the visitor center, the canyon rim, and the main hotel areas, making it very easy to get around on foot. The free shuttle bus system is ideal for accessing more far-flung locations. 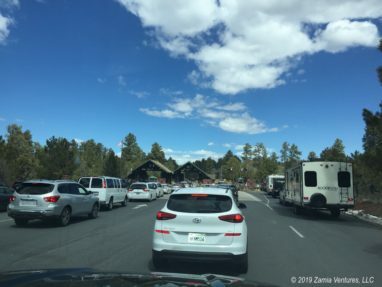 It’s possible that the crowds could overwhelm the system during very busy times, but during our visit we found that large shuttle buses arriving every 10-15 minutes kept wait times down to a very reasonable amount at the busiest stops. As a result, the only time we used our truck during our visit was to head east toward the distant Desert View area. 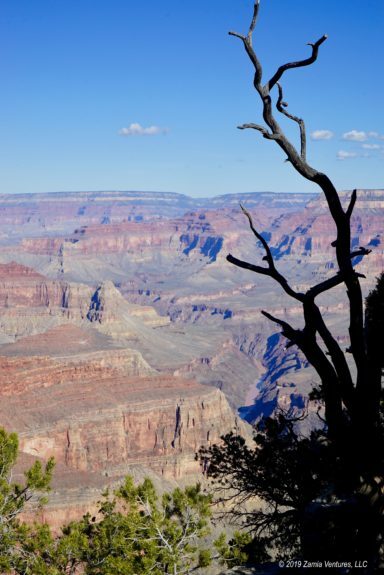 For us, the visitors didn’t detract from the huge and awe-inspiring scenery of the canyon. 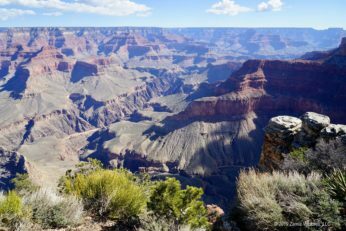 When we found relatively isolated canyon viewpoints – which was much easier than expected – the people we could see in the distance were so tiny as to barely give any sense of scale to the immense vistas we were trying to absorb. And standing at popular viewpoints and hearing exclamations of wonder and awe from people from around the world turned out to be surprisingly fun. In the height of summer the crowds might be overwhelming, but our shoulder season visit was not plagued by tourists. 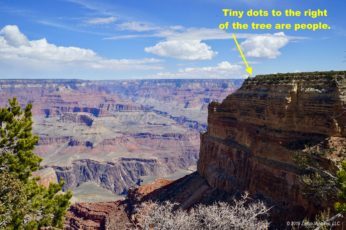 Yet we still had plenty of opportunities to point and laugh at the morons who walk out on thin outcroppings to get Instagram-worthy photos, despite the NPS’s cartoon-based warnings that this is one of the most dangerous activities at the park. (Another is vomiting from dehydration. I have spared you the illustration of that one. You’re welcome.) 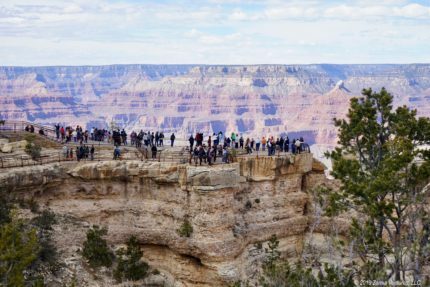 The mixture of different nationalities, ages, and tour groups all appreciating the views across the canyon made for a nice sense of shared humility at the awesome power of erosion. For those who hate hearing about erosion. We camped in the Mather Campground, which is run by the NPS and features the usual rustic accommodations (meaning: no hook-ups of any sort). 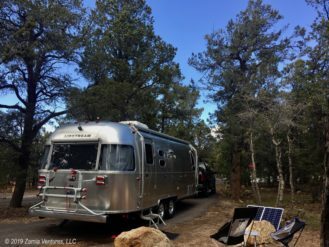 We approach the upper size limit for this campground (capped at 30 feet) and it was another affirmation of our choice to use a relatively small trailer in order to have access to the most appealing camping options. 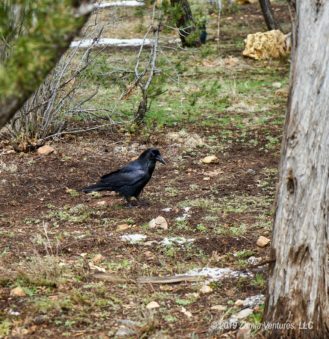 We absolutely loved being right in the heart of the park, with the visitor center and shuttle bus stops within easy walking distance, yet in a fairly dense forest filled with deer, elk, and birds ranging from huge and insistent ravens to sweet little nuthatches. We had reserved our spot with the hope that a few gaps in the tree cover visible on satellite images of the site would allow us to generate solar power, and it worked out perfectly during the days when the sun made an appearance. Our main hike in the park was along the Rim Trail. We caught one of the ubiquitous shuttle buses around 8 am and made our way out to Hermit’s Rest, 8 miles to the west of the main hospitality area in Canyon Village. Then we walked back into the village along the rim trail that hugs the edge of the canyon, which was challenging only because of the distance (total hike: 8.75 miles) and elevation (over 7,000 feet). The trail itself was mostly level and was even paved for about half of the route. 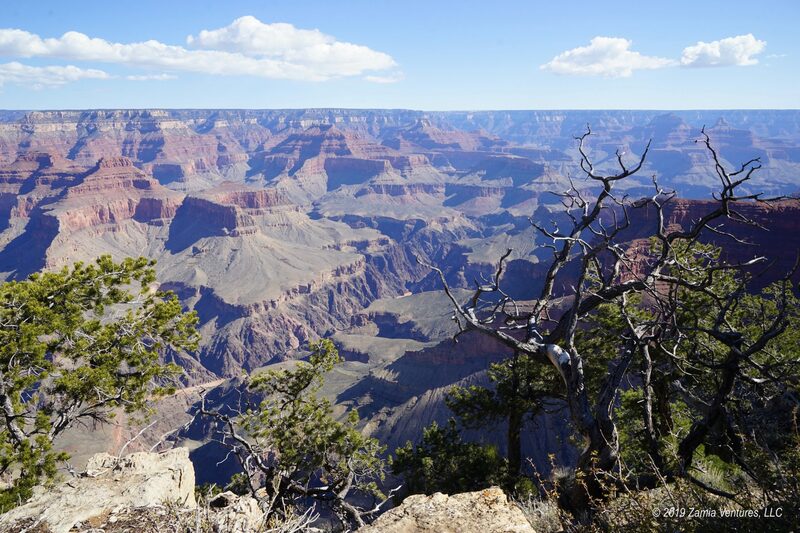 We enjoyed seeing different perspectives on the canyon that emerged as we rounded each corner. Peek-a-boo views from between the trees alternated with wide open vistas, and they were all dramatic and arresting. I was captivated by the contrast between skeletal snag and the colorful, undulating rock formations. Even Ken, who is not particularly fond of heights, was so drawn by the views that he kept approaching the edge to take it all in. One of the best aspects of this hike was that during our first several hours on the trail we barely saw any other hikers. 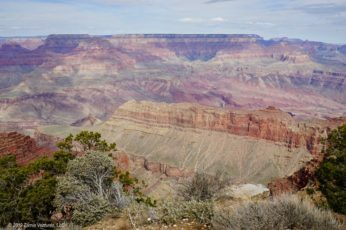 It was only in the last two miles, as we approached Canyon Village in the early afternoon, that we encountered a significant number of other people on the trail. As usual, getting out and walking away from the shuttle stops was a sure-fire way to have the place practically to ourselves. On another fairly nice day we headed east from Canyon Village to check out the section of the canyon toward Desert View. This area of the park is not served by the shuttle buses and does not seem to be visited as heavily as the central Village, but has some of the outstanding features of the park. 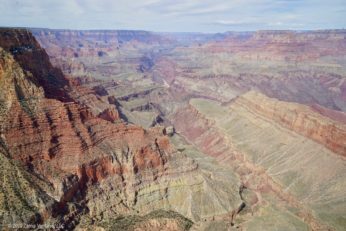 The erosion is more extensive, so weathered features include not just the canyon walls themselves but numerous buttes, stacks, pyramids, and other eye-catching formations. 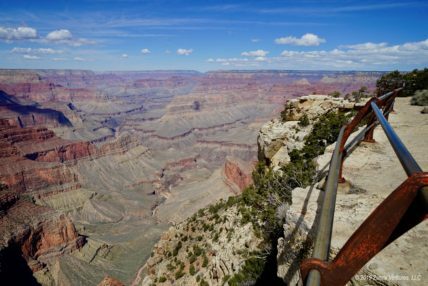 Several of the overlooks like Navajo Point and Lipan Point offer views into portions of the canyon where the very oldest rocks are exposed. 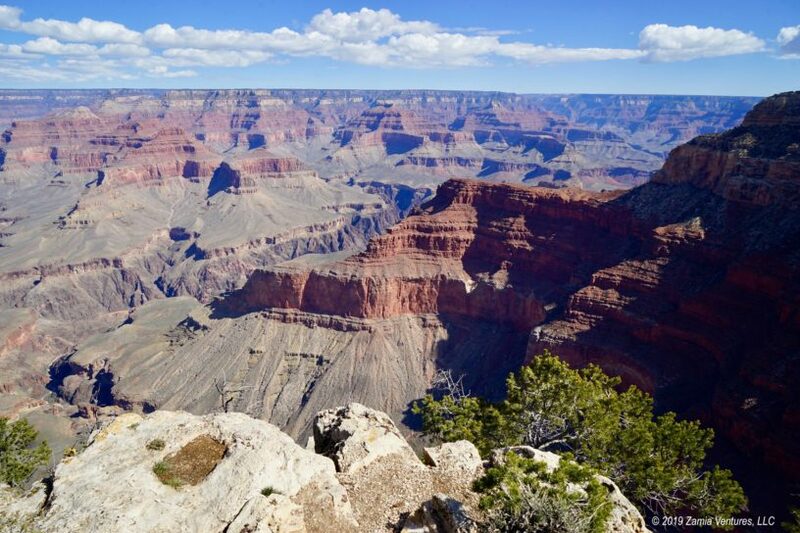 The “basement rocks” of the Vishnu Layer are 2 billion years old and these incredibly dense, hardened rocks were uplifted from the deepest portions of the Earth’s crust before being exposed by the relentless erosion of the mighty Colorado. After learning all about Mary Elizabeth Jane Colter and the Fred Harvey Company in Winslow, we made sure to visit several of the historic buildings associated with the early days of Grand Canyon tourism. 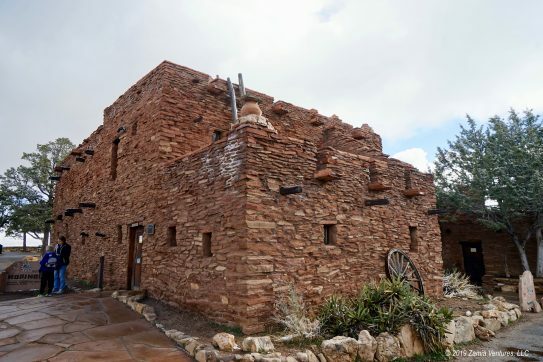 Knowing the history, the clever little building at Hermit’s Rest designed by Colter became much more than a gift shop seeking to separate us from our hard-earned cash. The Hopi House across from El Tovar is another well-designed gift shop. 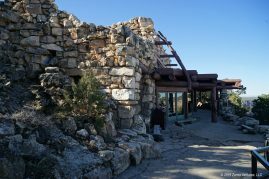 During our trip out to Desert View we of course stopped at the Colter-designed Watchtower, a modern steel lookout tower clad in stones to resemble a historic structure. 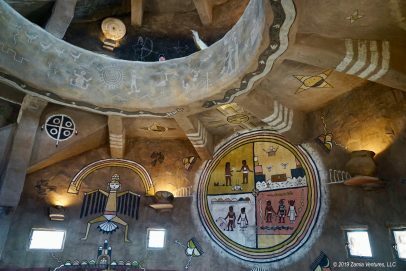 The Watchtower is either a brilliant homage to native southwestern cultures, or an embarrassing mishmash of cultural appropriation. I fear it may be the latter. However, we still enjoyed the views for miles afforded by its upper floors. 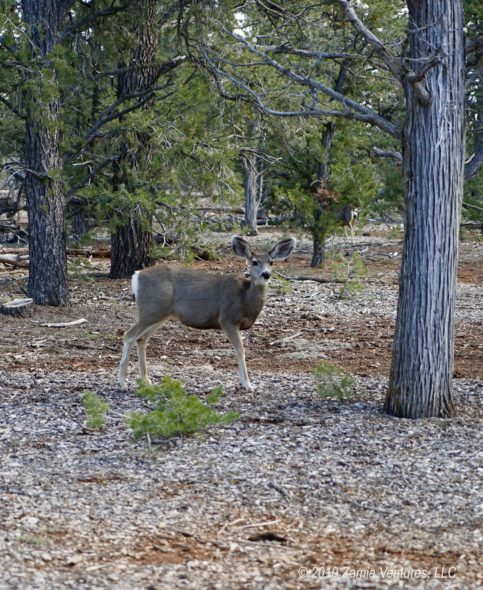 Throughout the park, I appreciated seeing the connection to the park’s early tourism history kept alive through many displays, a Fred Harvey branded food truck, and plenty of pertinent books on sale in the gift shops. Toward the end of our visit, the relatively warm, clear days gave way to our nemesis: cold weather. 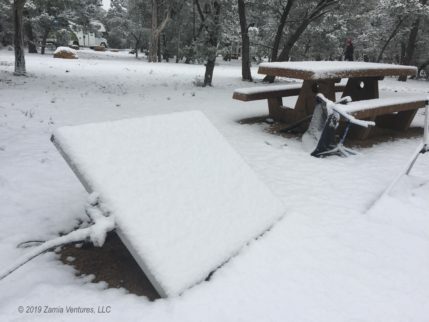 It was pretty startling to wake up to see snow blanketing the campground, but once we bundled up and got outside the winter wonderland was a marvel to behold. 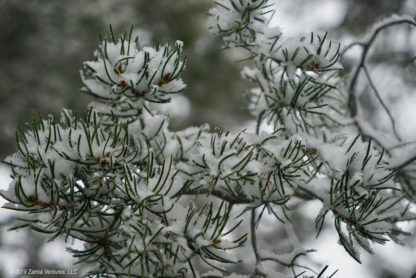 The snow turned the verdant landscape into a crisp black-and-white tableau. 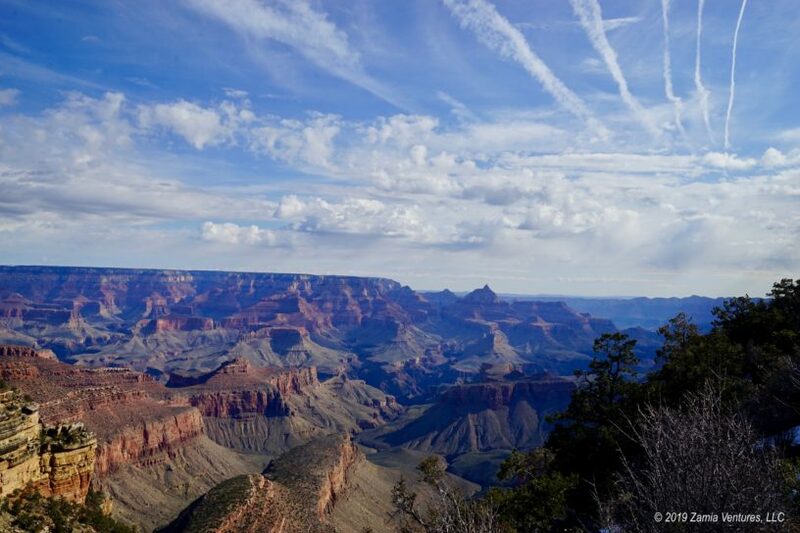 When we reached the canyon rim it was mesmerizing to see the clouds obscuring the line between earth and sky, making the canyon gape even larger. We were surprised to still see reasonably large crowds at the visitor center despite the challenging conditions, though the bicycle rental business seemed a bit slow. After the novelty of snow wore off, however, it was just cold and wet. So were were happy to hit the road to Las Vegas, where warmth and sunshine awaited. Your photos are fantastic! 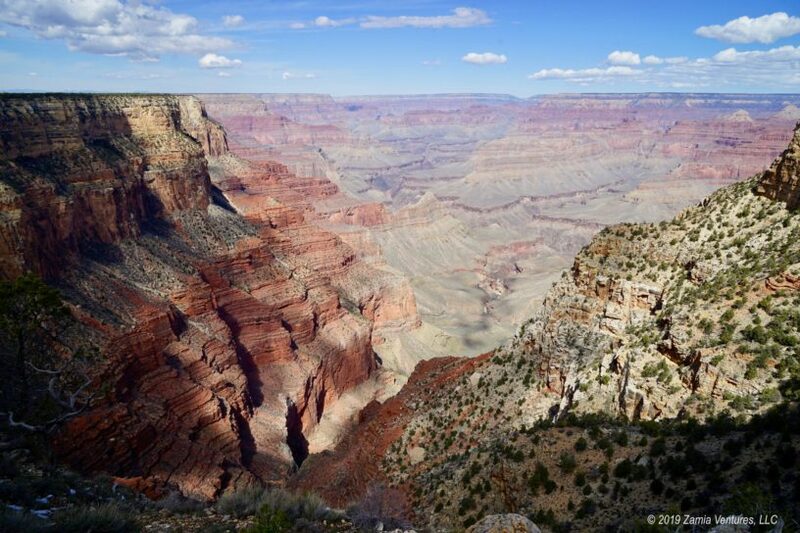 The grandeur of the Grand Canyon is notoriously difficult to capture in photos, but you did it! It’s been many years since we’ve been to the Grand Canyon. 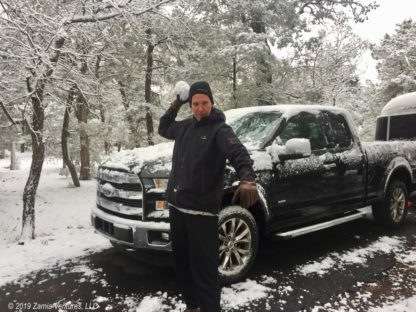 We’ve wanted to return, but it will definitely be in the shoulder season. The hike you did sounds like a good one. 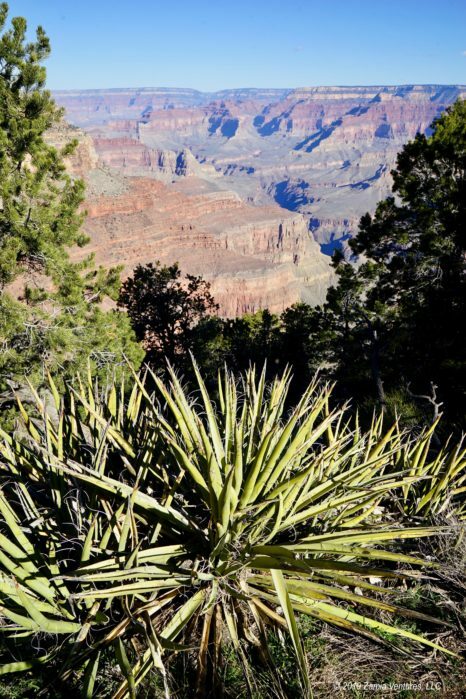 The last time I was at the South Rim, I hiked the Bright Angel Trail to the river and back in one day. In August. I think it was around 20 miles—it was the most grueling (and dumb) thing I’ve ever done. I won’t be repeating that experience, LOL!! Oh, so YOU’RE one of the crazy people the NPS warned us about. All the trailheads now have very stern warnings about NOT attempting to hike down to the river and back in a single day. You must be the inspiration! 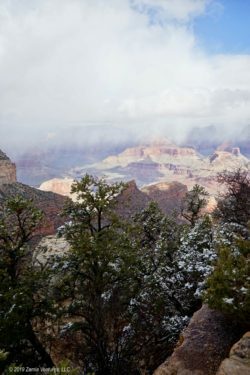 If you visit in spring, like we did, you wouldn’t be tempted to hike into the canyon because the upper reaches of the main canyon trails like Bright Angel were covered in ice/snow/slush, even though the rim trail was completely dry. Great things attract great masses, unfortunately — hate the tour-bus influx at the major parks — but it looks like you were able to get in some great “alone” time. 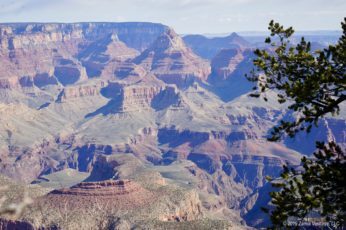 We have only been once briefly (limited by time and a dog) and we would also love to try to fit in the North Rim someday as well as more hiking. 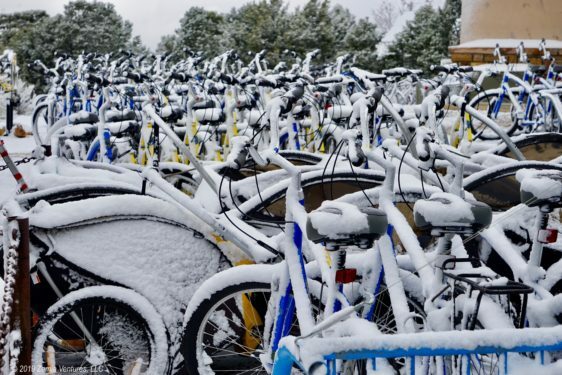 Though I don’t love snow, I do love the photos of the snow-covered solar panel and bicycles! 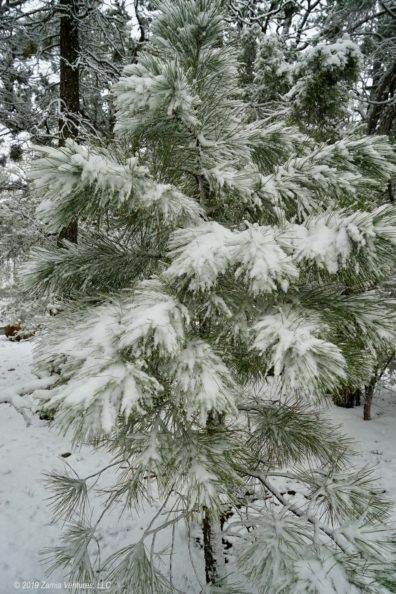 They capture the feeling of this past crazy Arizona winter perfectly. We were surprised by how un-crowded we felt at the canyon, but I think that was thanks to the off-season timing (which also brought us snow). 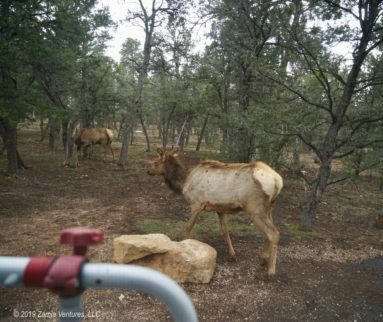 We are definitely trying for the North Rim next time! There won’t be as many vendors offering items to purchase / rent, but it should be easy to find solitude. Your photos are wonderful. Hopefully you’ve finally found consistent warmth in Vegas. My writing strategy: when all else fails, go with the truth. 🙂 Just kidding. But it is surprising how often places turn out to be different (and usually better) than we expected. That’s what keeps us hooked on travel!